I'd like to keep getting my oil and filter changes done at a local garage because I feel its more convenient. Can I keep doing this? No, at least not according to the manufacturer - if you wish to fully validate and protect all factory warranties. Even if "licensed" technicians from any other service provider performs the work and you have receipts to support this. The Ford Motor Company of Canada has the right to invalidate any portion of the warranty coverage as it applies to the parts affected by the lack of proper maintenance. Simply put, Ford has no way of knowing how qualified the technicians from another company may or may not be nor what materials (parts, fluids, etc) are used by any other service provider. We ask you to think of it this way. If you purchased a Sony television, a Dell computer or a Rolex watch, would you take any of them to anyone but the authorized Dealer for regular servicing or repairs? Isn't it more expensive to maintain my vehicle at the dealership? Great Question! 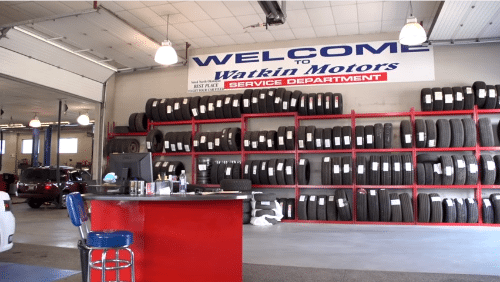 Actually, although it is a very common perception that other automotive service providers are cheaper than a typical Ford Dealership, studies show that just the opposite is true. The average charge (nationally) for a Maintenace Service #1 is $34.95 (plus taxes of course) at Ford Dealerships. The largest national chain of 'quick lube' stores advertise their equivalent of Ford's service #1 at $34.90 plus taxes - but it does not include 5W20 oil, which is now required on most Ford vehicles - and included only 5 litres of oil. Ford dealers fill to the actual capacity of the crankcase (for the same price) and do everything in accordance to the factory specifications. On a 2003 Ford Expedition, your total bill using the national average is $37.90; at the national 'quick lube' chain it is $52.60! You Ford Dealer will give you a full report card detailing over 38 different items that have been checked/inspected, measured and or topped up, all for our very competitive prices. Most Ford cars and trucks require a monthly investment of only $33 to fully maintain all applicable warranties - less than the cost of a cup of coffee a day. When I call to make an appointment, why does your dealership need my vehicle all day for just a regular maintenance visit? My local garage can do my oil changes in just and hour - sometimes less - and I can wait for it. We certainly appreciate the fact that your time is precious to you - it is to us as well. In order for us to do our best for you each time, we ask that you make an appointment so that we can be prepared when you arrive. We then schedule your vehicle into the system around other vehicles that are already ahead of you. Please keep in mind that we prefer to take our time checking each and every aspect of the vehicle that could affect your personal safety, convenience and your vehicle performance. At our dealership we have dedicated maintenance specialists who can quickly handle most Maintenance Service #1's and #2's (usually in about an hour - we still have to be thorough!) You are always welcome to wait on site at the dealership or take advantage of our Shuttle service. We can take you back to the comfort of your home or work, then pick you up once the job is complete. When arriving for your appointment, this time is for your Service Advisor and you to go over your individual service needs. This means that depending on carryover's and other customers your vehicle may not be started at that time. Your vehicle will be ready at your mutually agreed upon pickup time.